This is her photo. She uploaded in her facebook, and as a prove that she had received my postcard. She sounds excited. She said to me "I soaked pretty bad when I opened my mailbox and saw your postcard in the box. All bent and wet. I did not even bother to use my umbrella. I went straight to the box after I left the taxi. Hahaha, love the feeling when I first saw your postcard there." "I was so excited probably more than you think I was lol. 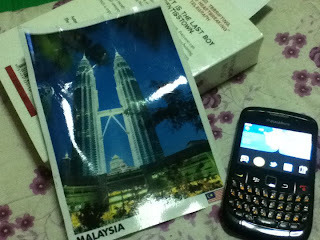 I did phone my home everyday just to check if the postcard arrived or not lol. And mom seemed to be happy too lol. Oh, I cannot believe it too because I did not think you would reply that. It just feels like a dream. If it is a dream, I do not want anyone to wake me up. Oh did you smell it? What did smell like? XD Smelled like ink? XD Smelled like meeeeeh? XD "